It was secateurs at dawn today when a trusty bunch of volunteers headed out into the reedbeds to collect seeds. Very cold work but we collected quite a few bin bags of them. These will be dried out by our new ecological engineering chum, Glyn Onione. And then be ready to be cultivated for new reedbeds that we anticipate being part of the sustainable solution to the Pond’s future. Just a small, but practical first step in the Fleet Pond Clearwater Campaign. Interesting recent discussion on the CEMEX Angling Forum on reminiscences of fishing for pike in Fleet Pond. Many years ago I used to fish Fleet Pond (the larger one of the two) for Pike and had some good fun down there with my biggest going to just under 20lbs…. I used to fish Fleet Great for the pike back in the early 70’s. Mainly off the station car park where the tunnels go under the line to Fleet Small. The pike would fry feed on perch then and would gang them up in the tunnel. Watching hundreds of fry climbing the walls trying to get away was a sight to behold. Used to catch the perch on a bare hook with a bit of fluff, leaf, anything really twitched through the water. I fished it last year – lure fished from a kayak and most of it was 18″ deep over a similar depth of silt. I only tried a couple of sessions, saw loads of fish activity but couldnt get anything on a lure at all. 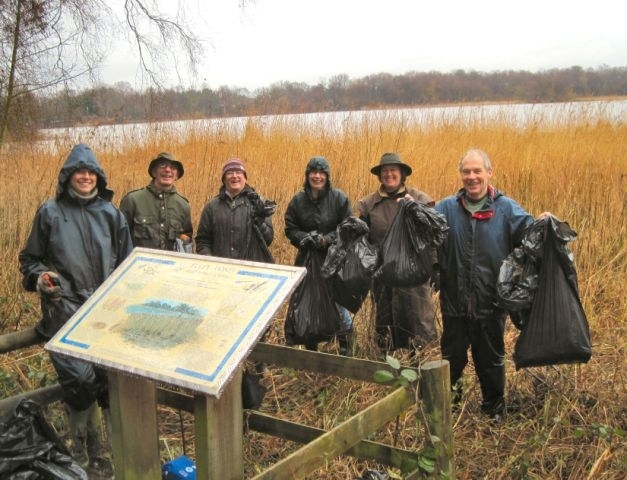 Anglers who would like to see the fishing experience at Fleet Pond improved might like to know that we (Fleet Pond Society) are about to launch a big campaign to raise mega-bucks to restore the pond’s biodiversity. If we can raise the cash we intend a major dredging programme and include repair and improvement of jetties among other improvements. Support by the fishing community will be welcomed. Please contact Colin Gray (see About page above) if you would like more information on or would like to support the biodiversity restoration projects at Fleet Pond. The Annual General Meeting of Fleet Pond Society will take place at 7.15pm on Saturday 20th February 2010 at the St. Philip & St James Church Hall, Kings Road, Fleet. We would like to encourage Members to attend, as this is your opportunity to put questions to the Executive Committee and to share your views on the future of Fleet Pond Nature Reserve. Following the official business of the AGM, there will be a short break for refreshments, before we announce the winners of the Photographic Competition 2009. We do hope that every one who has entered will come along to see their photographs on display. All members of the public are welcome to attend although only Members have voting rights. 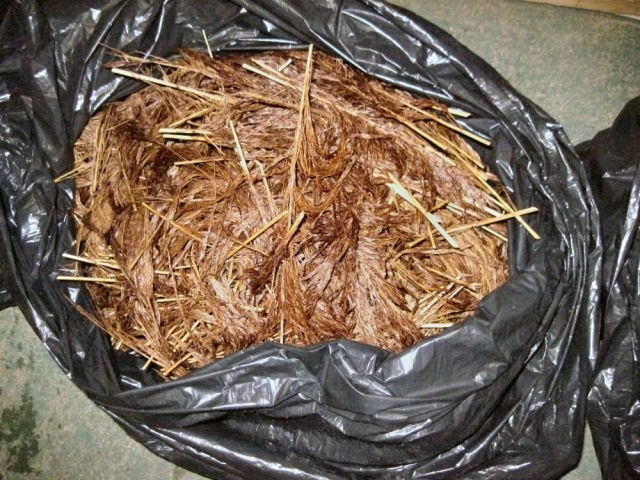 Our 14 Feb task will be on the Dry Heath tackling more birch. We achieved a lot at the December task but there is more we can tackle. Andy Golder is bringing along his team of Wildlife Explorers complete with assistants and parents so we could be a sizeable team, unless some of you have other things in mind for Valentine’s Day? Further details on the volunteer event schedule and meeting details can be found here. Curry Night Raises Bridge Fund! 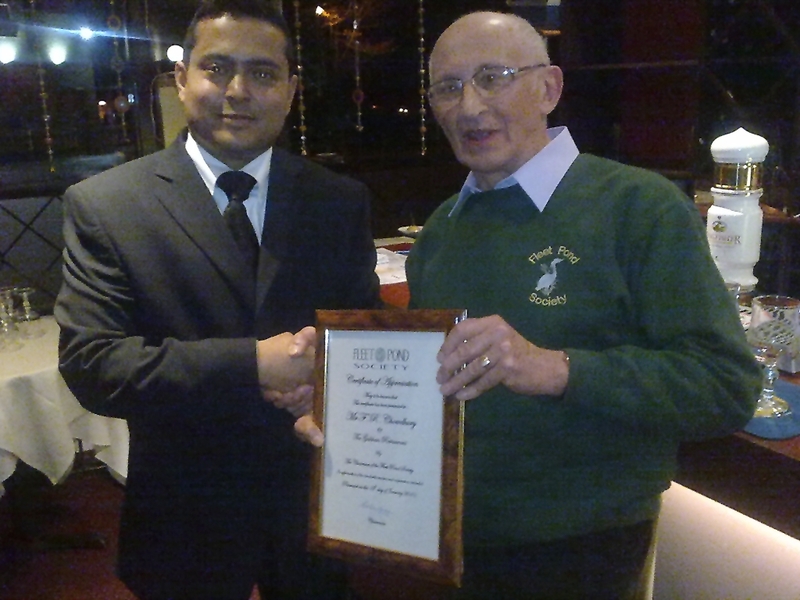 Fleet Pond Society Chairman, Colin Gray, presents Mr Chowdhury with a certificate of appreciation. An enjoyable evening was had by all at Fleet’s Gulshan Restaurant on 19th January at Curry For Carnival Bridge Night! The Gulshan’s Mr Chowdhury laid on a terrific meal, which was enjoyed by an assortment of guests, including members of the Fleet Pond Society and their friends, Fleet Lions and chums, plus staff from Hart Voluntary Action and the Environment Agency. The event was not only a great night out; it also raised £448.00 for the Carnival Bridge fund. The pond’s Carnival Bridge is in urgent need of replacing and the Society hopes to raise enough money through fund-raising and grants to buy a new one. Fleet Pond Society would like to thank Mr Chowdhury and his staff for looking after everyone so well and keeping us topped up with food! 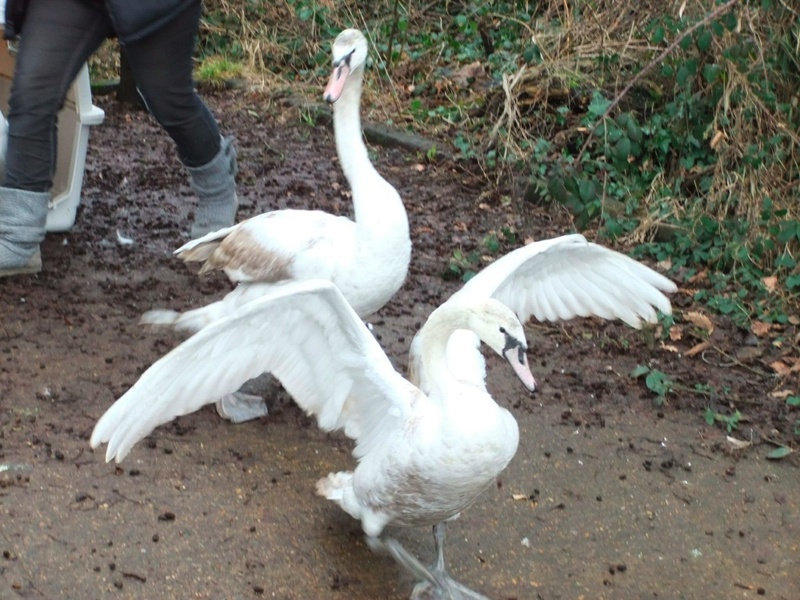 The Harper Asprey Wildlife Centre, Camberley, released three cygnets at Fleet Pond on Tuesday 2 February. Photo credits: Geoff Dee and Martyn Aubrey. You are currently browsing the Fleet Pond Blog blog archives for February, 2010.